n the post war year, many German aircraft designers feared the possible ban on aircraft production and begun to leave the country. Among them also Claudius Dornier Jr., the son of the famous German WW2 aircraft builder. He settled in Spain where he founded company named Oficinas Técnicas Dornier (OTEDO). In the middle 50’s, the Spanish Air Ministry was looking for a new STOL aircraft and having received the order, Dornier designed the Dornier Do 25 type, a high wing aircraft for a crew of four. 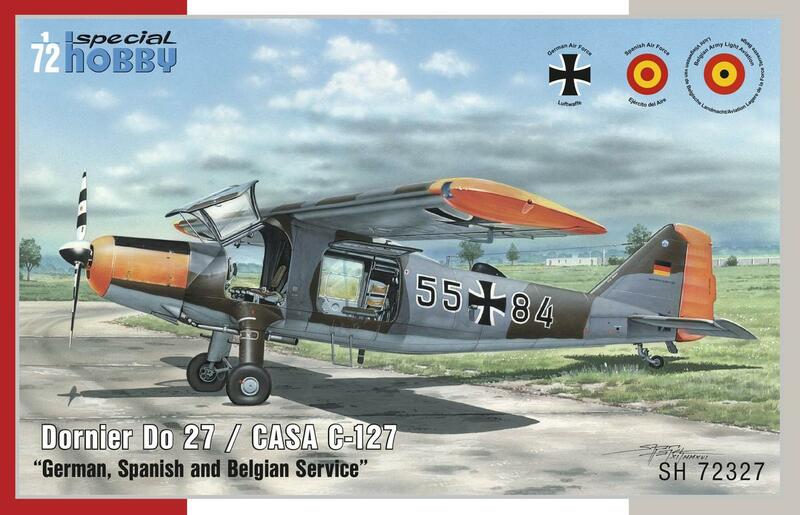 Two prototype airframes were built by CASA company in Spain, while in Germany, in rebuilt Dornier works, the type was redesigned to the Do 27, powered by the Lycoming GSO-480-B1B6 engine. This type was also finally put into production, becoming the first aircraft to be mass-produced in Germany after the war. In total, 428 airframes were built in several different versions and they were operated by all three services of the newly built German military, ie the air force, navy and land forces. At the same time, a 50-unit batch was also produced in Spain for their military, named the CASA C-127/U.9. The type’s many versions differed mainly by the style of the undercarriage, engine and propeller used, the shape of the tail fin or by having either single or twin controls in the cockpit. The Dornier Do 27 was not only used by air forces of many European countries, namely by Portugal, Belgium, Sweden, Switzerland and some others, but also elsewhere over the globe. It could be seen flying in several African countries, in the State of Israel and also in Turkey. The type found its way to civil aviation market too and was quite liked by so-called bush pilots for its excellent performance in harsh conditions of irregular transport lines in Africa or South America. In Europe, the Do 27 served as touring or skydiving aircraft. This nicely detailed model originates in steel moulding tools and comes on four sprues of grey styrene and one sprue of clear parts which can be attached also in open position – meaning both the front cockpit door and the large fuselage window on either side of the fuselage to nicely show the busy interior of the model. 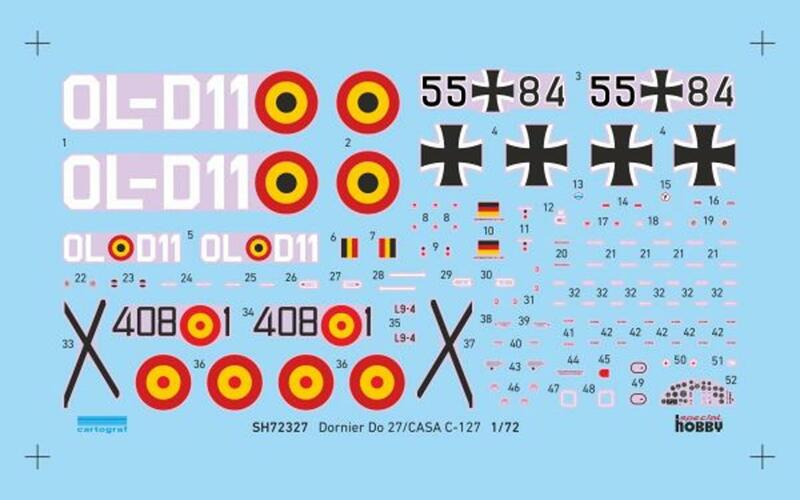 The decal sheet offers markings for three machines. The German option portrays a machine in standard camouflage with high visibility orange wing tips, rudder and cowling panels and what makes her even more interesting, with black and white stripped propeller. The two other options is a Belgian plane olive overall and a Spanish one in aluminium over pale blue as it was operated in the Spanish Sahara.